First and foremost, I want to think everyone who helped out with the planning and logistics of height events in ten days. An aggressive schedule that got me to Utrecht (The Netherlands), Lille (France), Antwerp (Belgium), London, and back to Amsterdam - a bit crazy but proportionally exciting! I presented this topic as a brain teaser, a softer, more entertaining session which address creativity vs data-driven management and how constraints (which are often revealed through analytics) are the essence of innovation. The presentation starts by asking "what is business success?" 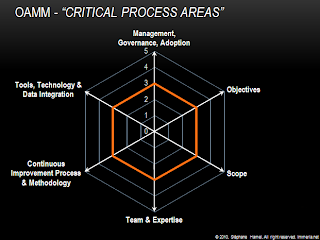 and gradually leads toward the six critical process areas presented in the Online Analytics Maturity Model. Workshops: "Online analytics: a managerial perspective"
The half-day or full-day workshop was presented in Lille, Antwerp, and Amsterdam. The workshop is built around the six critical process areas of the Online Analytics Maturity Model and presents several aspects that are too often neglected when doing online analytics. For once, we didn't even talked about the tools or specific tricks. Instead, we focused on learning the concepts that are essential in analytics and business optimization. I also got busy at a couple of social events where I touched on similar topics but also took the opportunity to talk about the Web Analytics Association, our goal of developing a stronger international presence with the help of active members. I also shared one of the ongoing project called Web Analytics Without Borders, where WAA volunter members are actively helping Save The Children - a great opportunity to learn, collaborate and share in on a real web analytics project. Since I'm a freelance and my model is to help agencies and organizations grow their own analytics practice, I was delighted to participate in private agency/client meetings. I was invited to share my insight but it also allowed me to witness several real-life practitioners and consultants challenges which will contribute to further refinement and improvements to the Online Analtyics Maturity Model. Someone said something along the lines of "social media is not about marketing, it's about people". I can't agree more! The biggest conversion of social media is not sale, it's meeting people face to face! I came back physically exhausted but mentally energized by the immense interest and a genuine desire to collaborate on making online analytics easier. Next week I'm heading to eMetrics Toronto, then it will be a local business intelligence conference in Montreal, eMetrics San Jose, London and Paris with a keynote appearance at the Webanalytics Congres in Amsterdam. Busy schedule for the coming months... it will be so great! See the full list of upcoming speaking appearance.